It might not be so much the individuals as the teams this year. 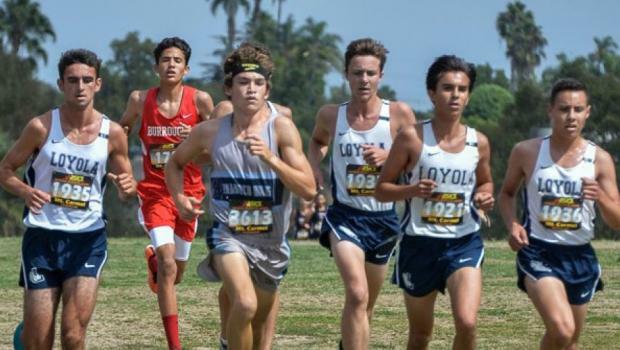 Three of the state's top boys teams -- Dana Hills, Los Angeles Loyola and La Costa Canyon -- are entered, which could produce some sizzling early-season performances. One never knows if schools will be entering their top runners but in the past all three schools have sent the best. Dana Hills figured to return four of its top runners until Caleb Niednagel, who was 10th in the state in Division I, transferred. He'll still run, however this time instead of wearing the blue and white stripes he'll be wearing the teal and black of La Costa Canyon. Dana Hills will feature Simon Fuller, who was 13th in the state, and the normally deep Dolphins will be favored. If it comes to depth, though, it will be hard to beat Loyola, which dominated this meet in every division a year ago. The time gap between Anthony Stone, who was 21st as a sophomore at 16:12.4, and No. 6 runner, Hudson Godfrey, was a little over six seconds. In between, Vinnie Giachini, Ethan Stauber, Mason Ratkovich and Roberto Ruelas battled among themselves for places. Local challenger La Costa Canyon may have the best 1-2-3 punch in the state but the Mavericks could be a little short-handed as coach Bill Vice will decide on meet day whether or not he wants Garrett Stanford to test his healing foot. Garrett's twin brother, Jacob, captured the 2-mile Bronco Invitational last week and right behind was Niednagel who is still adjusting to his new team but should be highly motivated to see his former teammates again. There are 41 teams in Division 1 including Roosevelt, which placed second in the state ahead of Dana Hills and Loyola, plus Queen Creek of Phoenix, one of Arizona's top teams. The way it's set up, the 64 schools in Division 2 are traditionally not quite as high-powered but there is no shortage of front-runners with the hosts among the best.